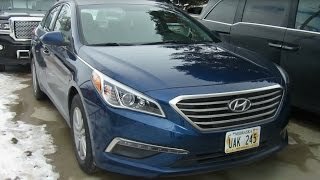 Sonata has been a life saver for Hyundai with its siblings Genesis and Elantra in the USA. The company from dead end today is among the top brands all because of them. So when it’s about adding new member in family, Hyundai definitely will take utmost care and will strive to bring the best in class. 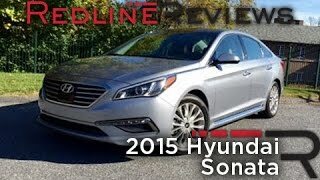 We must by now mention that the Hyundai Sonata 2015 is definitely that one sedan you’d love to have. Let us have a closer look and know more about this new sedan from Hyundai. The first thing which comes into notice soon after entering interior of Hyundai Sonata 2016 is its all new infotainment system. It comes with two options, a 3.8 inch LED display and an 8 inch full touch display. Both these variants offer USB and AUX support with voice recognition and smartphone integration. 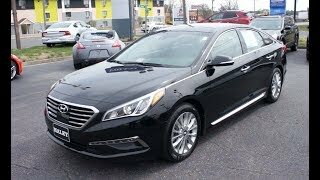 Apart from these the spacious Hyundai Sonata Sedan offers the front two passengers with vented, cooled and heated seats while the rear three has to find comfort upon the heated seats. The interior integration is very much driver focused and keeps in track all new safety features like the Advanced Smart Cruise Control (ASCC radar based), Blind Spot Detection and Lane Departure Warning System accompanied with optional High Beam Assist automatic switches. The Hyundai Sonata 2015 with its exterior is more angular than before keeping in mind the attractive curves and creases that make a Sonata. ‘Fluidic Sculpture 2.0’ is what they call this new design iteration beholding, touching a diamond shaped grille, large Xenon headlights touching the grille and LED daytime running lights. The rear comes with more attractive looks in which the remembrances from the predecessors like Kia Optima drive through the brains. 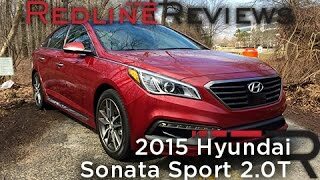 In all we would say the exterior of Hyundai Sonata 2015 is catchy and grasping but holds its roots in models you’ve seen little before. 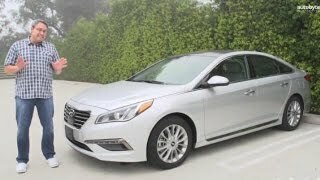 As far as Competitors for Hyundai Sonata 2015 are concerned, 2015 Mazda 6 and Chevrolet Malibu are longing to see the model in market.